Oh, am I happy. Here’s where I’ll be, every day, for at least some little period of time: xRank on Politicians. Every pollster and political consultant will like this – and okay, just plain political junkies anywhere, in this heightened political campaign year. Politicians themselves will also want to check out their up/down arrow (Virginia Gov. 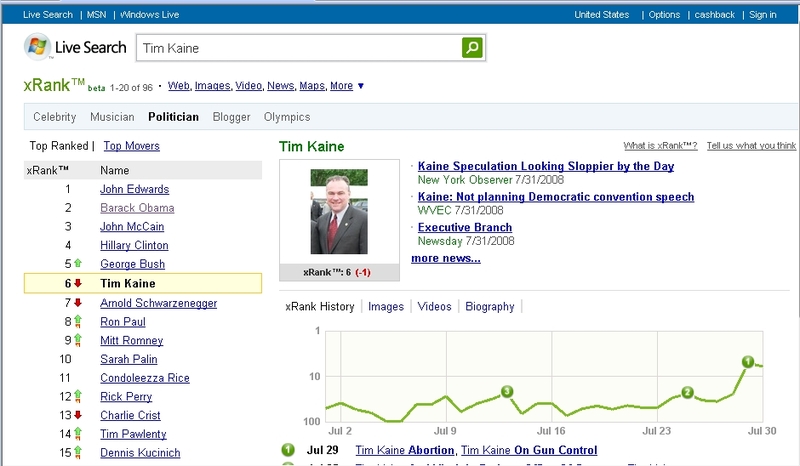 Tim Kaine was hot “with a bullet” for a while because of the Obama VP rumors, but he’s falling now; John Edwards love-child stories are hot-hot-hot! right now). Check it out yourself.